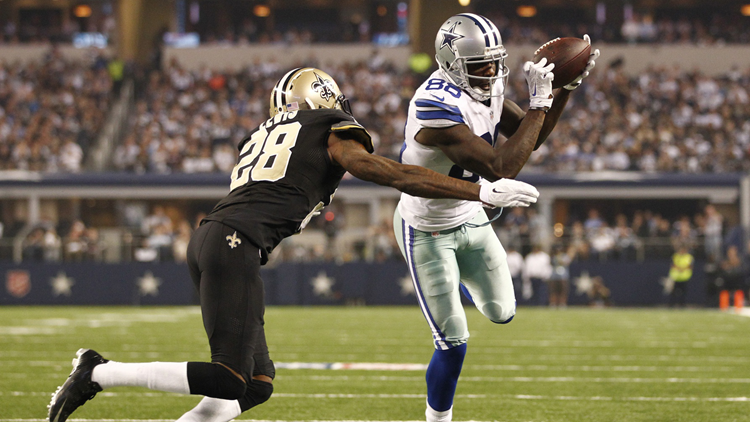 Sep 28, 2014; Arlington, TX, USA; Dallas Cowboys wide receiver Dez Bryant (88) catches an 18 yard touchdown pass while defended by New Orleans Saints cornerback Keenan Lewis (28) in the fourth quarter at AT&amp;T Stadium. Dallas beat New Orleans 38-17. Bryant, to complement star receiver Michael Thomas and multi-tasking back Alvin Kamara, provides another layer for the NFL's No. 2 scoring team.